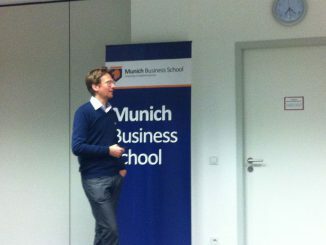 On 29 October 2014, Christoph Stadeler, Vertical Auto Lead EMEA at Facebook, gave a guest lecture at Munich Business School titled „Automotive Marketing & Facebook“. In particular, he addressed the changes at Facebook and their consequences for the automotive industry with regard to marketing issues. Stadeler is in charge of the Facebook automotive sector within the EMEA regions and responsible for Facebook’s worldwide cooperation with leading automotive manufacturers. Facebook was founded only 10 years ago, but the network already counts 1.32 billion members. This gigantic network opens a multitude of opportunities for the automotive industry. The mesmerized audience followed the presentation about the automobile’s digital revolution and the future cooperation potential between car manufacturers and internet companies. 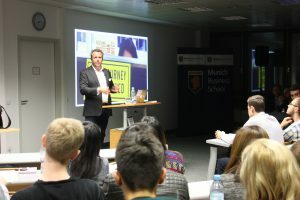 Connectivity was the presentation’s buzzword: The world is mobile and the significance of mobile devices is constantly increasing. They are changing our daily lives. This is also confirmed by the rapidly growing video consumption on these mobile devices. There are one billion views on Facebook every day. Stadeler helps his business clients to understand that, in the future, they will find their car buyers on Facebook, warning them not to underestimate online video consumption: addressing the user in targeted manner has become indispensable for automotive enterprises. He used case studies to demonstrate the possibilities of Facebook. 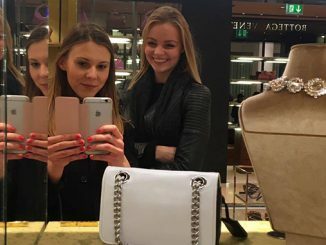 Stadeler made it clear, that Facebook can be used as an excellent tool from the launch of a new vehicle to lead generation and the establishment of customer relationships, and that it can be applied for personal and relevant marketing. In addition to figures and facts, he also addressed the shift from understanding the customer more as a user. 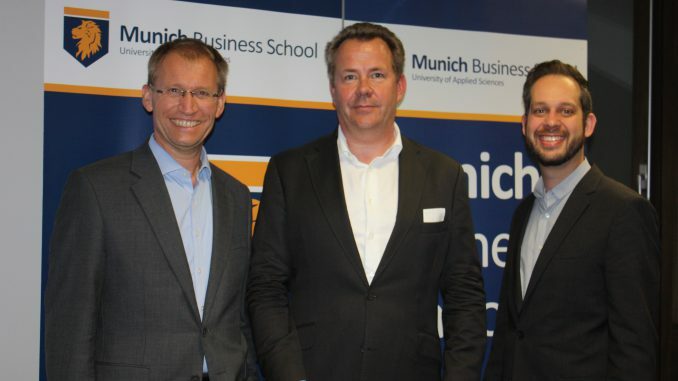 A comprehensive discussion with the students of Munich Business School closed the event.